The main difference between functional foods and nutraceuticals is that functional foods are the food with bioactive compounds such as beta-carotene, lycopene, resveratrol, ferulic acid, etc. whereas nutraceuticals are the bioactive compounds found in fortified food, dietary supplements or herbal products. Furthermore, functional foods have naturally-occurring bioactive compounds in the food while nutraceuticals can come as pills, capsules or liquids. These two terms are often used interchangeably though there is a subtle difference between functional foods and nutraceuticals. Both of them contain health-promoting properties as well as disease-preventing and medicinal properties. Functional foods are foods that contain bioactive compounds naturally. Significantly, these foods can provide health benefits beyond the traditional nutritional value of the food. Here, the traditional nutrients refer to the regular vitamins and minerals found in that particular food. Generally, traditional nutrients are essential to the diet, and their deficiency causes classical nutrient deficiency diseases. That means; the functional foods contain a unique form of nutrient, which in turn promote the health. In other words, vitamin C in orange prevents scurvy. On the other hand, vitamin D in sardine can alleviate rickets. However, both vitamin C and vitamin D are essential nutrients. Therefore, neither orange nor sardine becomes a functional food. For instance, soy protein has a function in reducing cardiovascular disease. But, since soy protein is not an essential nutrient in the diet, soy is a type of functional food. 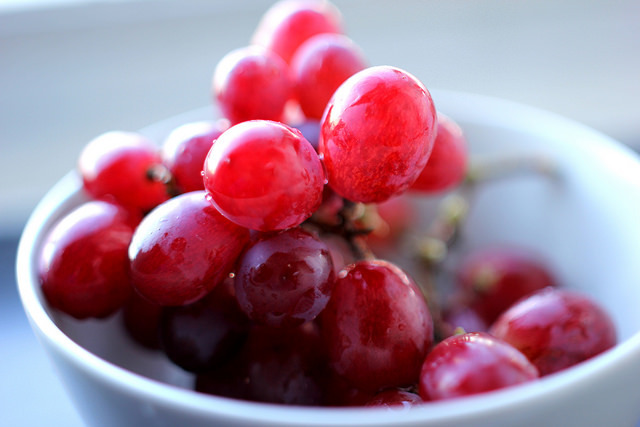 Likewise, red grapes containing phytochemical resveratrol, cranberry juice containing oligomeric proanthocyanidins, oat bran containing fiber, and barley containing beta-glucan are functional foods. Neutraceuticals are the bioactive compounds found in fortified food, dietary supplements, and herbal products. However, they are often defined synonymously with functional foods due to the presence of a specific nutrient in a particular food. Some examples of nutraceuticals in fortified food are the calcium fortified in orange juice and vitamin D fortified in milk. 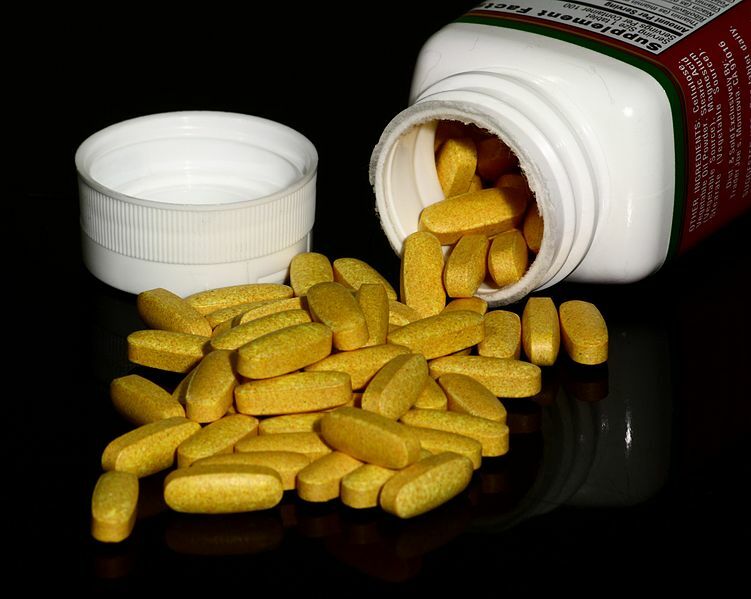 Furthermore, nutraceuticals come in the form of dietary supplements as pills, capsules, tablets, and liquids. Vitamins, dietary minerals, proteins and amino acids, essential fatty acids, bodybuilding supplements, etc. are examples of nutrients in dietary supplements. Functional foods and nutraceuticals are two types of compounds with related functions. Therefore, their names are used interchangeably. Also, both have health-promoting, disease-preventing or medicinal properties. Functional foods refer to the foods with ingredients which gives that food health-promoting properties over and above its usual nutritional value while nutraceuticals refer to the foodstuff (as a fortified food or a dietary supplement) held to provide health or medical benefits in addition to its basic nutritional value. Thus, this is the fundamental difference between functional foods and nutraceuticals. 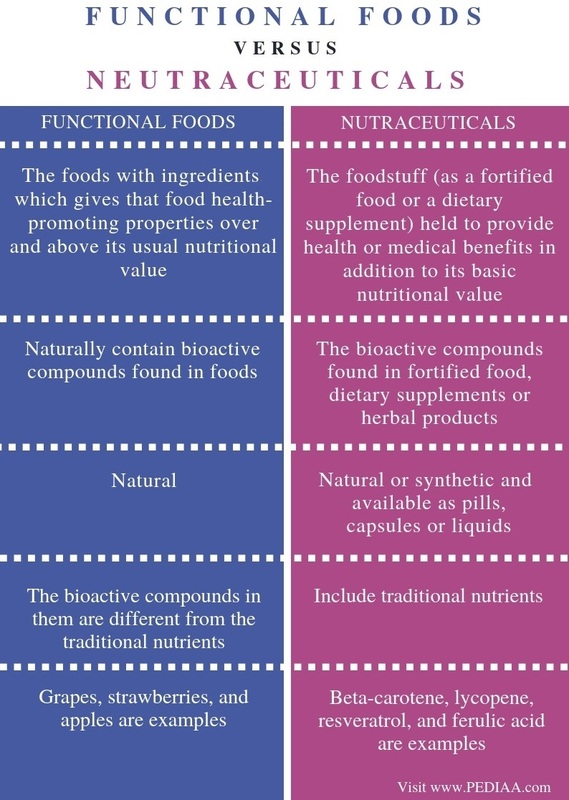 The main difference between functional foods and nutraceuticals is that the functional foods naturally contain bioactive compounds found in foods while nutraceuticals are the bioactive compounds found in fortified food, dietary supplements or herbal products. Another difference between functional foods and nutraceuticals is their origins. Functional foods are natural while nutraceuticals can be either natural or synthetic and may be available as pills, capsules or liquids. The bioactive compounds in functional foods are different from the traditional nutrients while nutraceuticals include traditional nutrients. Hence, this is another difference between functional foods and nutraceuticals. Grapes, strawberries, and apples are examples of functional foods while beta-carotene, lycopene, resveratrol, and ferulic acid are examples of nutraceuticals. Functional foods are the naturally-occurring foods, which contain bioactive compounds including beta-carotene, lycopene, resveratrol, ferulic acid, etc. On the other hand, nutraceuticals are the bioactive compounds, which have proven health benefits. They are fortified in some foods or can be taken as dietary supplements or herbal products. Therefore, the main difference between functional foods and nutraceuticals is their correspondence.